The earliest authenticated reference to the surname in Ireland is found in the Annals of Ulster, which records the names of Muirchertach and his son Eoin (John). In 1207, ‘Muircertach O Milluga[i]n (or O Maelaga[i]n)’ was elected chief lector of the abbey of Derry of St. Columcille, after the death of the late lector, Domnall Ua Muiredaigh. A lector was a monk entrusted with the reading of the sacred scriptures in the church or abbey refectory. In 1220, following a dispute over the election of Flann Ua Brolcháin, abbot and successor of St. Columcille, ‘Muirchertach Ua Millugain’ was elected to replace him. It is unclear from the annals why the clergy of Derry were in dispute over the succession of Flann Ua Brolcháin, but it seems the choice of Muirchertach was acceptable to both the clergy of Derry and the chief council of the Cenél Eogain. For the next year or so, Muirchertach held the office of abbot and chief lector, before his right to hold them were challenged by Geoffrey Ua Daighri, herenagh of Derry. The matter was only settled after they appealed to the archbishop of Armagh, who chose Eoin, Muirchertach’s son, to the lectorship, a judgement that settled their difference. In the Annals of Ulster, Muirchertach’s surname is spelt differently in two manuscripts; MS 1282 in Trinity College Library in Dublin and Rawlinson B 489 in Bodleian Library in Oxford. In the first reference dated 1207, the editor of the second volume of the Annals, B. Mac Carthy has written O Milluga[i]n and in brackets, supplied O Maelaga[i]n from MS 1282. This manuscript was compiled in Co. Fermanagh and was known as the Annals of Senat, having taken its name from the residence of Cathal Mac Manus, who lived at Shanad, now called Belle Isle, an island in Upper Lough Erne. In the Gaelic text dated to 1220, the style ‘hUa Milluga[i]n’ and ‘O Milluga[i]n’ are translated as Ua Millugain and O’Millugain from Rawlinson B 489. This manuscript is believed to be the original compiled in the late fifteenth and early sixteenth centuries. The copy made by Cathal Mac Manus has been dated prior to 1498, when he died at Lough Erne. Further south in the Wicklow Mountains at Castle Kevin, sometime between 1257 and 1263, an inquisition was held to inquire into the temporal jurisdiction exercised in the manorial courts of the archbishop of Dublin under the first three English prelates promoted to the see through the influence of the kings of England. John Cumin, the first of them, was ordained in 1181, and succeeded by Henry de London in 1213 and Luke in 1229. The inquisition was held during the time of Fulk de Stanford, bishop of Dublin 1257 to 1271. Castle Kevin was located in the old medieval diocese of Glendalough, which was united with the diocese of Dublin in 1214. It was originally built by the O’Tooles probably in the twelfth century. Amongst the list of jurors who gave evidence to the inquisition was ‘Molior Omolegane’, whose appearance at the court suggests he had local knowledge of the matters being heard and lived in the bishop’s manor. The personal name of Molior Omolegane is shared with ‘Maoilire O’Maolagain’, chief poet and bard to the O’Reillys of East Breifne, which today covers most of Co. Cavan. In 1293, the celebrated Giolla Iosa Roe O’Reilly succeeded his brother Matthew O’Reilly, as prince of East Breifne. During his reign Maoilire O’Maolagain flourished as Giolla Iosa’s chief poet. One of Maoilire’s poems has survived and celebrates the deeds of this chief in the poem entitled “We went on a hosting with Giolla Iosa the valiant”. This poem with others, appears to be the source of O’Hart’s claim that the O’Mulligan/Mulligan family of Breifne were hereditary bards to the O’Reillys. The chief poet might well have been early associated with a branch of the Conmaicne Rein in Co. Leitrim or Co. Cavan, which is discussed below. The personal name ‘Maelagan’ appears in the Book of Fenagh, which takes its name from the old Abbey of Fenagh in West Breifne, generally associated with County Leitrim. In Irish Genealogical tradition, several O’Mulligan families have pedigrees attached to them. The oldest are the O’Mulligans in Co. Donegal, who are associated with the Cenél Moain, a branch of the Cenél Eogain. The ancestor of this cenél, Eogain, is reputed to be one of the sons of the legendry Niall of the Nine Hostages. The pedigree of the sept of the Ua Maelagain is given in the Book of Ballymote compiled either in 1390 or 1391, and the Book of Lecan compiled between 1397 and 1418. Niall .ix. ghiallaig > Eogain > Muiredhaigh > Muain > Colmain > Faelain > Edalaigh > Tendalaig > Ferrdalach > Cathanigh > Uí Maelagan. Niall Noi-giallach > Eógan > Muiredach > Muan (or Maien) > Colmán > Faelán > Etalách > Tendálach > Ferrdálach > Cathánach > Uí Maelacáin. The Ua Maelagain are given as a branch of the Clann Cathánigh (Keany or Keane) of the Cenél Moain and are akin to the Ua Gormghaile (O’Gormleys) and the Ua Luinigh (O’Lonney). In the following pedigrees, they are compared alongside the pedigree of the Ua Maelagain and the Ua Lochlainn (McLaughlin) kings of the Cenél Eogain. The Ua Gormghaile pedigree is taken form Cú Choigríche O Cléirigh’s (O’Clery) genealogies. The genealogy of the Cenél Moain appears in three sections: ‘Minegud sencais Ceniel Moain’ (Explanation of the history of the Cenel Moain), Genelach Cenél Moain Ichturach (Lower) and ‘Genelach Cenél Moain Uachtarach’ (Upper), from whom came a number of other family surnames, some now obsolete. According to the Books of Ballymote and Lecan, from Cathanigh came three other family surnames, including Ua Faelain and Ua Oirc, possibly Coric, the personal name “Corc”. It forms part of the patronymic name McGurk, found in both Ireland Scotland. There was a time when we would not repent of it. Siol meaning ‘seed’ of Maolagain appear to have been at the height of their power in the thirteenth and fourteenth century and had a fearless reputation for plundering in Donegal and beyond. The editor of O'Dubhagain’s poem, John O’Donovan, suggested Tir MacCarthainn takes its name from Caerthann, son of Fergus, son of Conaill (who gave his name to Tír Conaill and the Cenél Conaill). He then notes, ‘the Abbe MacGeoghegan places this district to the east of Boylagh, but on what authority O’Donovan did not know, as the pedigree of this race is lost. He goes on to say ‘neither MacFirbis nor O'Clery was able to supply the chasm in the Books of Lecan and Ballymote’. I take this to refer to the MacCarthainn genealogies rather than the Ua Maelagan, which is mentioned by MacFirbis, but omitted by O’Clery. In the Ceart Uí Néill, which recites the obligations, tributes and provisions due to the Ó Néill kings from the other kings of Ulster, the O’Mulligans are called ‘Ó Maoilegáin of Magh gCaoroind’. Their chief was one of at least 13 minor lords who were obliged to provide military service under the O’Donnells, when called to muster the men of Tir Conaill. Although the present copy of the Ceart Uí Néill is only dated from the sixteenth century, it is believed to have been based on earlier copies compiled after the defeat of the Mac Lochlainn kings at the battle of Cameirghe in 1241, when the O’Neills emerged as the victors and for the next three hundred years, successively ruled the northern Uí Néill. Coupled with O'Dubhagain’s poem, the Ceart Uí Néill sheds more light on the Siol Maolagain’, who were evidently still regarded in the sixteenth century, as one of the leading septs in Tir Conaill able to provide fighting men for the O’Donnells and O’Neills. In 1593, they were followers of the O’Donnells, when Hugh Roe O’Donnell, lord of Tir Conaill, led a rebellion against Turlough Luineach O’Néill and in the following year, the English Government in what became known as the Nine-Years’ War between 1595 and 1603. In 1602, when Rory O’Donnell succeeded his deceased brother, Hugh, he travelled to London, where he submitted to King James I. In return, the king created O’Donnell earl of ‘Tyrconnell’ by letters patent on 4 September, 1603. The following year, in February 1604, he received a further grant of territory in Co. Donegal and with all his ‘natural followers’, including “Donell and Twohell O’Moylegane” of Tir Conaill, received a royal pardon for their part in the late rebellion. After what became known as the ‘flight of the earls’ in 1607, when Rory O’Donnell and Hugh O’Néill, earl of Tyrone, went into exile with their families, all their lands were confiscated along with some of their followers in Co. Donegal and Co. Tyrone. In 1608, another rebellion erupted and its leader Sir Cahir O’Doherty, lord of Inishowen, was killed in a skirmish against government forces near Letterkenny in Co. Donegal. Amongst those pardoned the following year for their part in the rebellion were Shane O'Molligan, Donnogh Ballagh O'Molligan and Swine O’Moligan, whose names are listed in the company of Owen O’Gallagher of CoolemscItrian, pardoned on 10 March, 1609. In September, 1610, King James I granted to Cuthbert Cunningham, a native of Scotland, a patent of naturalisation, and the land and manor of CoolemscItrien in All Saints Parish, which had belonged to Owen O’Gallagher in the barony of Raphoe. It seems very likely then that Shane O'Molligan, Donnogh Ballagh O'Molligan and Swine O’Molligan were members of the Siol Maolagain and after the rebellion some may have been dispossessed of their lands in Co. Donegal. Where then was the territory of Tir MacCarthainn? In their books on Irish Surnames, Edward MacLysaght and John Grenham place the ‘Ua Maolagain’ chiefs as lords of Tir MacCaerthain in the baronies of Boylagh and Raphoe. Patrick Woulfe makes the ‘O Maolagain’ a ‘Tirconnell family who were chiefs of Tir MacCarthain in the east of the barony of Boylagh, but seem to have been disposed and dispersed at an early period’. Michael O’Laughlin in his Families of County Donegal hopelessly confuses his sources for the ‘O’Maelagain’ by asserting Geoffrey Keating’s History of Ireland makes them ‘chief of Tir Mac Caerthain, a territory included in the baronies of Raphoe and Boylagh’, and then notes O’Dubhagain (O’Dugan) also gives them as a ‘clan of Moy Ith in the 12th century and well settled in Tyrone at the time’. 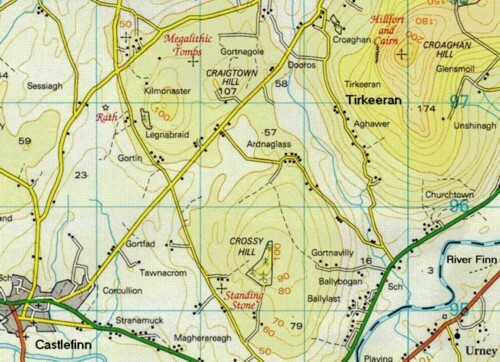 In his article on the Coarbs and Erenaghs of County Donegal, Patrick Gallachair suggested the ‘Siol Maelagain were evidently the ‘Mointermolligan’ (Muinter-Mulligan), who were an herenagh sept and held four quarters of church land in the civil parish of Tullyfern in the barony of Kilmacrenan’ (see Map 1). The term muinter refers to the ‘family of’ or ‘household of’, and when applied to a common ancestor, it usually refers to one’s people or folk. A quarter of land was the fourth part of a ballybetagh (containing about 16 townlands) and in the parish of Tullyfern there were eight ballybetaghs. At an Inquisition taken at Lifford on 12 September, 1609, it was found, the “mointermolligan” paid to the bishop of Raphoe a rent of 4 marks Irish per annum, 32 meathers of butter and 108 meathers of meal, according to the inhabiting of the land, 36 free gorts are equally divided among the tenants, and 12 other free gorts belong to the bishop’s official, for which the herenagh pays to the official the rent of 12 pence her annum and 40 shillings yearly pension to the bishop, for his third of the tithes. The term herenagh or erenagh is the anglicised form of airchinnech, which originally signified the head or superior of an early Irish ecclesiastical community called a monasterium, translated as monastery. The smaller monasteria were more familial and in early medieval times, the herenagh was usually a cleric, who might or might not proceed to priestly or episcopal orders. After the twelfth century Reform, their estates and lands were transferred to the bishops, and they became primarily the chief tenants of episcopal land. The hereagh still continued to retain their sense of being ‘ecclesiastics’ and were bound by the ancient monastic obligation of providing hospitality to pilgrims, strangers and travellers. The herenagh became a sort of manager or chief of the church land. He was elected by the local coarb or herenagh sept, and if suitable, was then approved in office by the bishop. The herenagh’s duties were to provide from his revenue for the support of the clergy and the maintenance of religious service, churches and chapels. Very little is known about the ancient monastery of Tullyfern, Gaelic Tulach-fion, tulach means ‘hill’ and fionn ‘white’, or the ecclesiastical community associated with it. It was located in the medieval tricha céd of Tir Lugdach, which takes its name from the Síl Lugdach. Traditionally, the Síl Lugdach are said to have been descended from Sétna son of Fergus son of Conaill. In his book Lug’s Forgotten Donegal Kingdom, Brian Lacey has made the case that the offspring of Lugdach may have been a distinct and separate kingdom before their raise to power over the Cenél Conaill. It is also questionable that Fergus son of Conaill had a son called Carthainn. In the Irish Genealogies, the number of his sons varies between four to seven with the first four usually given as Sétna, Brenainn, Feidlimid and Logharn or Loarn, said to have been the four sons by Eirca, daughter of the king of Dál Riata. To these can be added Líathinnid or Nindnidh, Cormac and Carthainn. It seems more likely, Carthainn’s name was a late addition and a clue partly avails itself in a text called the Tuaraschhail Coluim Cille, which lists the names of the six sons of Carthainn: Uanu, Tarbh, Cairell, Crimthann, Mac Laisri and Finan. They are associated with the family and community of St. Columcille, which had strong ties with the abbey of Iona in the old territory of Loarn in Argyllshire. As already noted, the lands occupied by the Muinter-Mulligan were ecclesiastical lands held directly from the bishop of Raphoe and not the O’Donnell kings of Tir Conaill. It could be inferred then that the chiefs of the Siol Maolagain ruled a distinct territory and its people. In this context, it is possible the hereagh sept of the Muinter-Maelagain were indeed a branch of the Siol Maolagain, who in the Ceart Uí Néill occupied “Magh gCaoroind”, translated as “Magh Caorainn” by Éamon Ó Doibhlin. This version of the name suggests they occupied the ‘plain or flat land of Caorainn’, a place-name that by the beginning of the seventeenth century had all but disappeared. It is interesting to compare the list of chiefs and their territories between the Ceart Uí Néill and the topographical poem by O'Dubhagain. In the former, the Siol Maelagain immediately follows the O'Cearnachan (Kernaghan) and Muinter Dalchaín, (the people of Dalachán, a diminutive of Dálach), who were chiefs of Tuath Bladhach, anglicised Doe (now Creeslough and Dunfanaghy) in the north of the barony of Kilmacrenan. In the latter, they follow the O’Breislin from Fanad, a peninsula also in the north of the barony, but precede two other septs from Tuath Bladhach, the O’Muireadhaigh and O’Conaill. With two references placing the Siol Maolagain amongst the people who lived in the old barony of Kilmacrenan, it raises new questions about the origins of the O’Mulligan in Co. Donegal. For example, could there have been two distinct families bearing this surname, one associated with Tir Conaill and the other with the Cenél Eogain? Or had the Muinter-Maelagain already split off from the main stem, possibly from Muirchertach Ua Maelagain, abbot of Derry of St. Columcille? Both were associated with ecclesiastical centres and perhaps shared a familial connection, the threads of which we can only scantily observe in what material records have survived from the Middle Ages. There are huge gaps in the records, and not until the first half of the nineteenth century, in the Tithe Applotments (1828-1834), do we catch a our first glimpse of the area they seemed to have clustered, and they do indeed appear in the old barony of Kilmacrenan (see Map 1) and by then in the civil parish of Tullaghobegly. The civil parish of Clonleigh was one of three parishes embracing that part of the territory of Magh Itha located in Co. Donegal, the rest of Magh Itha extended into Co. Tyrone. The other two parishes are Donaghmore and Urney, and all three parishes lay in the diocese of Derry. The old abbey of Derry of St. Columcille also came within the diocese of Derry and the influence of the Cenél Eogain; as already noted above Muirchertach Ua Maelagain was elected with the consent of the Cenél Eogain. It seems therefore he might well have belonged to the Cenél Moain, who considered themselves to be part of the Cenél Eogain. Two further pieces of evidence point to a family descending from the Cenél Moain. In the parish of Donaghmore, we find the townland name of Lisnamulligan, which means ‘Maelagain’s fort’. This townland may well have taken its name the Ua Maelagain, for as late as 1665, the name of John O’Mulligan is listed in the Hearth Tax rolls covering the Castlefin estate in Donaghmore. With the place-name Lisnamulligan and a family of O’Mulligan in the old territory of the Cenél Moain, the genealogy of the Ua Maelagan may well be genuine. 1084: Domnall ua Gailmredaigh was killed by Domnall ua Lochlainn, king of the Cenél Eogain. 1090: Gilla Críst ua Luinig, chief of Cenél Moain was treacherously killed by Domnall ua Lochlainn. In the Milligan/Milliken DNA Project, there are about five different STR haplotypes within four SNP haplogroups that appear to be Irish’s clades, rather than Scottish. The four SNP clades are: R-M222 with two subclades, followed by the E1b1b1, I-M223 and J-M267 haplogroups. The history of the principal O’Mulligan and Mulligan septs and families is also explored in more detail and includes references to early Irish genealogical sources and what extant medieval records have been preserved. It aims to cover as many known families, spelt variously as Mulligan, Mullegan, Melligan, Milligan, Mellican and Mulgan, who can trace their ancestry from the Middle Ages. It is acknowledged, though, few families can be chronicled prior to 1700. Genetic-genealogy is beginning to identity a subclade for the O’Gormleys in Cos. Donegal and Tyrone, known as R-M222>S603>A1742, which may be indicative of the O’Mulligan signature associated with the Cenél Eogain. As noted above, the genealogical tractates of the Cenél Moain record a common ancestry between the Ua Gormghaile (O’Gormleys), Ua Luinigh (O’Looney) and Uí Maelagan (O’Mulligan), which suggests the ySNP S603 may have been carried by all three branches. To date S603 ySNP has only been found in a cluster of O’Gormley and McAnellys. The history of the Cenél Moain is closely associated with the men of Magh Itha and for a detailed study on the topic, I would recommend the late Dr. Brian Deeny’s article Ceneál Moain and the O’Gormleys in East Donegal and West Tyrone. Reference should also be made to the O’Gormley DNA Project, where current developments and genetic research are being monitored by the project administrators. Only one ‘O’Mulligan’ in the Milligan/Milliken DNA Project, who gives his ancestry as Co. Donegal, has been tested with 37 Y-STR markers and assigned the haplogroup E1b1b1 (E-L117). There is an interesting study on the E1b1b1 haplogroup in the McCarthy DNA Project (see Haplogroup E1b1b1). It is suggested that the spread of E1b1b1 from Europe into England was carried via auxiliaries in the Roman army and in particular Thracian troops. For the study, see Steven C. Bird’s Haplogroup E3b1a2 as a Possible Indicator of Settlement in Roman Britain by Soldiers of Balkan Origin. Since the Romans never conquered Ireland, it has been suggested they may have arrived by subsequent diffusion through trading, raiding or plantation across the Irish Sea in the past 1500 years. 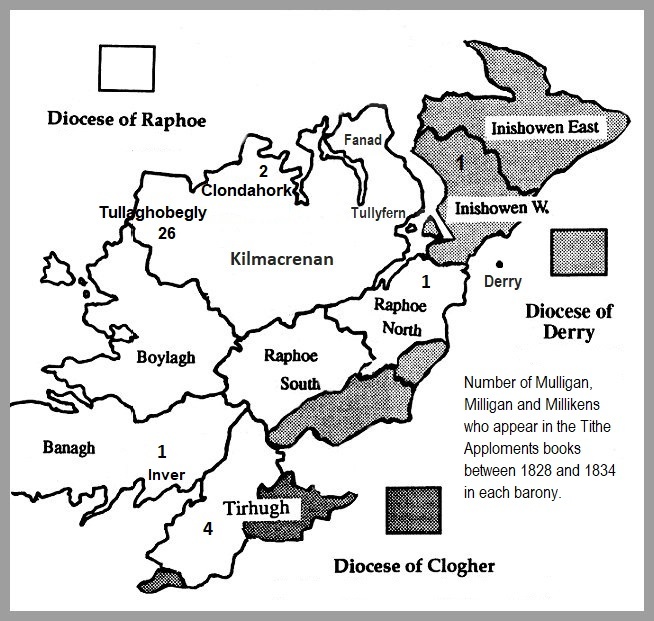 The E1b1b1 O’Mulligan ancestor might also have had ecclesiastic connections with Europe and arrived as a cleric, perhaps via the abbey of Derry of St. Columcille or some other church. There is a second E1b1b1 member with an undefined ancestry and a 12 Y-STR marker test, who might well share an early ancestry in Co. Donegal. In Irish genetic-genealogy, the R-M222 haplogroup is usually associated with the Uí Néill, but not exclusive to it. 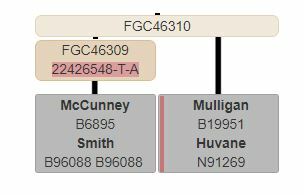 Two subclades appear within this haplogroup and one is defined as M222>DF106>DF104>DF105>FGC46310. This ySNP is also shared with a person surnamed Huvane. In the Y chart below, the surname Huvane is taken to be an anglicised variant of the Irish Ó hÚbáin, which is rare and first appears in the 1500s in Co. Mayo, see Huvane’s History. Interestingly, the seventeenth Irish genealogists, Dubhaltach Mac Fhirbhisigh (MacFirbis) and O’Clery make the Ó hÚbáin or O’Hubain in Co. Mayo a branch of the Cenél Eogain in Ulster, descending through Fergus son of Eogain. If there is any truth to this tradition, then it would have implications for other surnames listed. There is another member confirmed I-M223, a haplogroup formerly known as I2b1. 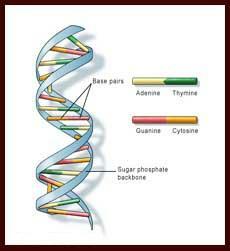 He shares genetic STR matches with a cluster of Carrs in Co. Donegal, who are found in the CTS6433>I-Y9161 subclade. In addition, he matches a Dougherty (Doherty) and Sweeney, two family surnames also associated with Co. Donegal. He shares a close match with the Kilkers, Gaelic Giolla Ghéir, a very rare surname found in Glencastle, Belmullet, in Co. Mayo. The presence of this genetic signature in both Co. Donegal and Co. Mayo is highly suggestive of a migration pattern and based on the matches shared with the Carr, Dougherty and Sweeney family surnames, this member’s ancestry could well have come from Co. Donegal. The plantation of Ulster introduced to Co. Donegal, Milligans and Millikens of Scottish ancestry, who appear in seventeenth century records as Mulligan and probably belong to the Scottish M222>DF106> DF104>DF105>FGC4133 subclade. One family are known to have settled in barony of Banagh, and their names appear in the c.1630 muster roll of John Murray, earl of Annandale in Dumfriesshire, Scotland. Along with Andrew Murray, Neile O’Cassan, John Horestanes, John Stuart, Thos Carnes, John MacLaghty, Thos Frisall, Robert Modiey, John Makonell, Archd Horner, Alex Shilane, John Creighton, Patr Makey, Wm Huett, David Firley, John Reynolds, David Tapen and Thos Creighton, George Mulligan was the subject of a claim against him by John Murray at the Irish Chancery in Dublin on 10 February, 1618. Molligan, George, no arms, f. 195a. Jackson, David, younger, no arms, f. 196a. Shankeland, Gilbert, no armsn f. 196a. Milligan, John, younger, no arms, f. 196a. John Murray, earl of Annandale, acquired a number of proprieties in the baronies of Boylagh and Banagh belonging to other Scottish planters, such as, William Stewart of Garlies, Sir Patrick Vaus of Barnbarroch, Sir Patrick McKee of Larg and George Murray of Broughton. In the barony of Banagh, the Earl owned the whole of the parish of Killybegs and the townlands of Aighan, Ballybedonnell, Ballyloughan, Croagh, Darney, Druminiscal and Rahan in the parish of Killaghtee. The 1665 Hearth Money Rolls of County Donegal lists the names of Robert Shanklan and Widow Milikin, who immediately follows Shanklan, in the parish Killaghtee. The widow might well have been the spouse of George Mulligan, and mother of “John Mulligan” of Ballyloughan in the same parish, who was one of 14 jurors sitting at the Coroner's Inquest held at Dunkineely on 15 September, 1660, into the death of Alexander and John Murray were found dead. In his book ‘The Fermanagh Story’, Peadar Livingstone claimed the O’Maolagains were an Aileach family and chiefs of Boylagh and Raphoe in Co. Donegal, before coming to Fermanagh. Here they settled in the baronies of Magherastephana and Clankelly, and probably gave their names to Mullowulligan, otherwise Milligans, and Eshywulligan townlands in the parish of Clones. Robert Bell in his ‘The Book of Ulster Surnames’, goes one step further and notes that they lost their lands during the plantation of Ulster and migrated to Counties Fermanagh, Monaghan and Mayo. According to the same author, in Fermanagh the O’Mulligans settled in Magherasteffany and Clankelly, and in Monaghan, in the northwest and centre of the county. This cannot be entirely correct, as the O’Mulligans in Magherasteffany and Clankelly were already there in the 1400s. This cannot be correct, as the O’Mulligans where already in Fermanagh as late as 1485. If in fact they came from Co. Donegal, it is much more likely they descended from a family already living in Fermanagh, before the plantation of Ulster, who settled near Clones, perhaps about the time the Ua Luinig of the Cenél Moain settled in Fermanagh. On the other hand, they might well descend from an alternative lineage separate from the Northern Uí Néill. In 1485, the Annals of Ulster record the slaying of ‘Gilla-Padraig, son of Maghnus, son of Domnall Ua Mailigein’ (O’Mulligan) the Tall and Cathal Ua Timain (Ua Daimhin) the Tawny, son of Aedh the left-handed. Both men had been in the company of Feidhlimidh, son of Donchadh Mag Uidhir (Maguire) and Donchadh, his kinsman, who were wounded and taken by Brian Mac Gilla-ruaidh (MacGillroy) and Aedh and Gilla-Isu, sons of Edmond Mag Uidhir, king of Fermanagh. In revenge for the killing of Gilla-Padraig and Cathal, Feidhlimidh, son of Donchadh Mag Uidhir, lead a party of the Muinter Maelagain, Muinter Timain and others against the Mac Gilla-ruaidh, which resulted in the slaying of Gilla-Padraig son of John Mac Gilla-ruaidh. The family name of Mac Gilla-ruaidh is still preserved in the townland of Ballymackilroy in the parish of Aghalurcher and barony of Magherastephana (see Map 3). The Ua Daimhin or O’Daimin chiefs also claimed to share the same ancestral history with the Maguire kings of Co. Fermanagh, and McMahon kings of Co. Monaghan. The association of the Muinter Maelagain with the O’Daimin seems to indicate the period during which they flourished and in the Annals of Ulster, we find three obits that support this observation: the death of Brian Ua Maelagain in 1439, Cathal Ua Maelagain in 1441 and Domnall Ua Maelagain, a poor person devoted to God in 1446. Although, these obits lack any specific detail about where each individual lived, it can be inferred they died during the period when the Muinter Maelagain flourished in Co. Fermanagh in the 1400s. As late as 1447, the O’Daimhin still held some power and influence in the district, as we find them engaged in a rival dispute with the Maguires, when ‘Domnall Mag Uidhir’ was slain by another branch of the Maguires, supported by the sons of Mac Orighialliagh and two of the sons of Ua Daimin of Tirkennedy, formerly known as Tir Cennfota. The Muinter Maelagain seem to have left their name in two townlands in the parish of Clones and barony of Clankelly, namely, Eshywulligan and Mullowulligan now Milligans, where their descendants were still living during the first half of the seventeenth century. On 8 March, 1615, we find Neile O'Mullegan and Cnogher mcCafforrie of ‘Mullaghglasse’ on trial at Enniskillen in Co. Fermanagh before Sir John Blenerhasset, Knight, one of the Barons of the Exchequer, and Sir Robert Oglethorpe, Knight, the second Baron of the same Court. It was found that Con Roe O'Connelly of Mullagheglasse, yeoman, on the 20 November, 1614, at ‘Dromeforde’, stole a brown cow worth £3, the property of Edward Sibthorpe, gentleman, and was aided on the last day of the same month by Cnogher mcCafforrie and Neile O'Mullegan of Mullaghglasse. The court found in their favour and they were acquitted. The townland of Mullaghglasse is Mullaghglass, which is located in the parish of Clones near to Eshywulligan and Milligans. The statistical account seems to have only recorded the number of Irish households and their surnames, if they were considered to be more than a few in a given area and in the case of Co. Fermanagh, it accounted for the highest group of O’Mulligans, also spelt as O’Mullican, in Ireland. Since the statistical account made a difference between the surnames of O’Mulligan and O’Mullican, the spread of O’Mulligans can only be estimated by barony, but it seems the highest number were found in the baronies of Clankelly and Magherastephana, where we find the strongest historical tradition with the rest spread over other baronies. As we will shortly note, the next counties with the highest number of O’Mulligans were located in Co. Longford and Co. Westmeath in Mid Ireland. The demographics of these figures show that by the time of the Irish Rebellion in 1641, the Muinter Maelagain in Co. Fermanagh were the largest O’Mulligan clan in Ireland with a genealogical tradition that is purported to be Airgialla, an old native people of Ulster. There is a second Northern genealogical retention that belongs to the Airghialla, otherwise the Oirghialla in Ulster and might well have an important bearing on the Muinter Maelagain in Co. Fermanagh. According to John O’Hart, a branch of the O’Maolagan share a common ancestry with the O’Garvaly traced from ‘Fergus Garbhgeill’, said to be descended from Cairbre an Daimh Airgid. However, in the Book of Ballymote, they are traced from Fiachach Cassán son of Colla Crich (Forcrích), one of the three legendry Collas, who founded the kingdom of Airghialla. Traditionally, Colla Crich is said to have had four sons: Imchad, Findachad, Rochaid and Fiachach Cassán. From Fiachach Cassán (also called Fiachra) descend the Síl Fiachach Cassán, and their branches, the Airthir of Ard Macha, Uí Breasail, Uí Nialláin, Uí Dorthain, Uí Eochada, Uí Cruind and Uí Trena. The Book of Ballymote provides the earliest record of the O’Garvaly pedigree, which is not found in Laud’s Genealogies, Rawlinson B 502, Book of Leinster or Book of Lecan. The two pedigrees, respectively, are compared below to show their line of descent from the two sons of Colla Crich, king of Airghialla. Both O’Hart and the Book of Ballymote agree on the lineage between Muiredach O’Garvaly and Fergus Garbhgeill, but diverge into two separate branches traced from two brothers, Fiachach ogr Fiachra Casan, and Rochaidh, the sons of Colla Crich, king of Airghialla. Brian son of Cairbre an Daimh Airgid is said to have been the brother of Daimhin, ancestor of the O’Daimhin, anglicised to Davin/Devine, former lords of Fermanagh; Cormac, ancestor of the Maguires who subsequently succeeded as lords of Fermanagh; Nadsluagh, ancestor of the McMahon lords of Farney in of Co. Monaghan. The Annals of Ulster date the death of Cairbre an Daimh Airgid to 514 AD, and with nine generations following him, it suggests Mailacain or Maolagain died sometime in the eighth century, long before the Book of Ballymote was compiled. By the time the family of O’Garvaly begins to emerge in history, O’Hart notes they were chiefs of Partarigh or Partry, an ancient territory at the Partry Mountains in Co. Mayo, defined by the civil parish of Partry”. The schism between O’Hart’s genealogy and the Book of Ballymote appears to reflect a geographical split between Co. Mayo and another branch that remained in Ulster. If O’Hart’s genealogy is to be accepted, it also seems a branch of the O’Maelagain believed they shared a common ancestry with the O’Daimhin, Maguires and MacMahon. They are not mentioned in the Geinealaighe Fearmanach, but in the Annals of Ulster, already cited above, the Muinter Maelagain are the most likely since they lived under the O’Daimhin and Maguire lords in Co. Fermanagh. However, at the time of writing, I have been unable to find a pedigree from fifteenth century onwards that directly traces both the O’Garbhgeill in Co. Mayo and Muinter Maelagain in Fermanagh to the Síl Fiachach Cassán. Similarly, the possibility that a branch of the Siol Maolagain of Co. Donegal settled in Fermanagh cannot be ignored, particular as the genetic signature of the Muinter Maelagain remains unknown. If someone descended from the O’Mulligans in Fermanagh where to take a Y-STR and Y-SNP test, it might help to determine which genetic haplogroup they are defined by within the male Y-Chromosome. 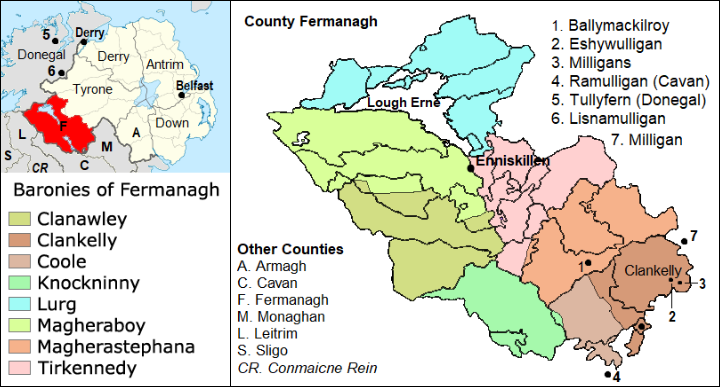 Along with County Fermanagh, Counties Cavan, Monaghan, Leitrim and Longford all bound one of the old historic provinces of Ulster, Connaught and Meath. Within these counties, there are several other place-names derived from the name Maelagain or Maolagain: Ramulligan (Raith Maolagain) in the civil parish of Annagh in Co. Cavan; Milligan (Maolagain) in the civil parish of Tedavnet in Co. Monaghan; and Cloonmulligan (Cluain Maolagáin) in the civil parish of Kiltoghert in Co. Leitrim. As already mentioned, Maoilire O’Maolagain, chief poet and bard to the O’Reillys of East Breifne, covering most of Co. Cavan, dedicated a poem to Giolla Iosa Roe O’Reilly in 1293. If there is a connection between Maoilire O’Maolagain, Ramulligan (see Map 3, no. 4) in Co. Cavan, Milligan (see Map 3, no. 7) in Co. Monaghan, and the Muinter Maelagain in Co. Fermanagh, we could be dealing with a much larger clan spread out over several counties. In the 'Statistical Census of Ireland' c.1659, there are nine O’Mulligans in Co. Monaghan and twenty-one in Co. Longford. There are very few early references relating to the O’Mulligans in Cavan, Monaghan and Leitrim, though, there are some for Longford found in the Pardon Rolls. On 13 November, 1602, Sir Frances Shane, knight, issued a pardoned to ‘Shane O Diermot, Wm O Diermot, Philip Moleghine, and Oyne O Suleghane, Henry and Teige O Shymeghan, Gillernow O Suleghan, and Philip O Suleghan of Moyntergarane’ in the barony of Granard; to ‘Brene O Moleghan’ of Lysnenoan (modern Lisnanagh) in the barony of Granard; and to Edm. O Molegan of Tully, all in Longford. The following year, at Granard on 10 January 1603, a writ was issued in the name of King James I restoring to the O’Farrells and others all their lands in Longford, including ‘Shane O Diermot and Wm O Diermot in the 5 cartron of Muntergeran’, a district on the west side of Lough Gowna in Longford. On 22 July 1603,’ Patrick O’Mollgan’ of Granard, carpenter, was also granted a pardon. These references support the presence and number of Mullegans found in the Statistical Census of Ireland, and since they all appear in O’Farrell’s country, it is possible they may belong to the same kindred group. The O’Farralls of Longford are traditionally associated with the Conmaicne, who are said to trace their decent from Fergus son of Róig, a pre-historic king of Ulster. In the genealogies of the Books of Fenagh and Ballymote, the personal names ‘Maelagan’ and ‘Maelcain’ appear the lineage of the Conmaicne Rein in West Breifne, an old territory that covers most of Co. Leitrim. The territory of Conmaicne Rein also extended into the northern part of Longford. Maelcain’s father Dubh son of Luachan had thirteen sons, including, Maelcain ‘a quo Ui Maelcain’, another variant form of O’Mulligan. According to Michael O’Duigeannain, before the Uí Briuin invasion of Breifne the people of the Conmaicne Rein were the dominant people in the baronies of Leitrim, Carrigallen and Mohill. The approximate extent of their original domains within these territories can, perhaps, be inferred from certain place-names, which include, Magh Réin probably derived from Loch Reane near Fenagh, called Fidnacha Máighe Réin, presumably meaning the plain of Réin. A family of O’Mulligan gave their name to Cloonmulligan, Cluain meaning ‘meadow’, otherwise, Maolagain’s meadow in the civil parish of Kiltoghert and barony of Leitrim. It is located near Carrick-on-Shannon and seems to have been associated with the O’Mulligan, possibly from an early date and been Ui Maelcain. In modern Irish surnames, the old Gaelic names of Uí Maelcain, Uí Maelchein and Uí Mailgen can also be anglicised to O’Mullegan, O’Mulligan, Mullegan, Mulligan, Milligan etc. In his ‘An English Index to the O’Clery Genealogies’, a supplementary work to Seámus Pender’s edition of Cucogry O’Clery’s Book of Genealogies, Frank B. Payton indexed the genealogy of the Uí Mailgen of Thuaithe Da Muighe in Co. Offaly, under the variant surname of O’Mulligan. Furthermore, in his introduction he notes that the prime objective of the index is to assist the researcher without a knowledge of Irish by supplying the modern, anglicised versions of surnames and in this case, he employed the standard of anglicised forms used by Dr. MacLysaght in his works on Irish families and surnames. O Mulligan [or O Milliken], H. Mailgen Thuaithe Da Muighe, paragraph 1782. Remark, this name is now unknown from this derivation. Tuath da Muigh or Tuomoy lies in the Baronies of Warrenstown and Coolestown, Co. Offaly. Seámus Pender edition of the Uí Mailgen of Thuaithe Da Muighe in Co. Offaly. §1782. Maolgen m Fogartaigh m Cumuscaigh m Flaithbhertaigh m Floinn da conghal m Diomusaigh. 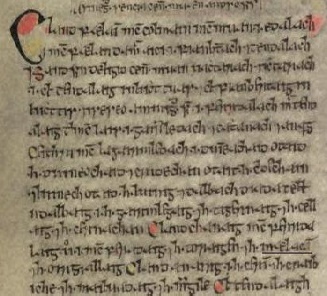 In his ONOMASTICON GOEDELICUM, Edmund Hogan notes the ‘Ui Maelchein in Tauth da Maige in Leinster’, and cites as his source the Book of Leinster, Book of Ballymote, Lebar Branach p. 152 and Dugald MacFirbis’, p. 471. In Dugald MacFirbis’s Book of Genealogies 1649-1650, Ui Maelchein is spelt as Ui Mailchen. The Ui Maelchein genealogy is cited in earlier Irish genealogies and these can be broken down in the following order by the approximate year of compilation. Máel Cian m Fogartaich m Cumascaich m Flaithbertaich m Flaind* m Díumasaich m Congaile m Forannáin m Congaile m Máel h-Umai m Cathail m Bruidge m Nath Í m Rosa Failgi m Cathaír Máir. 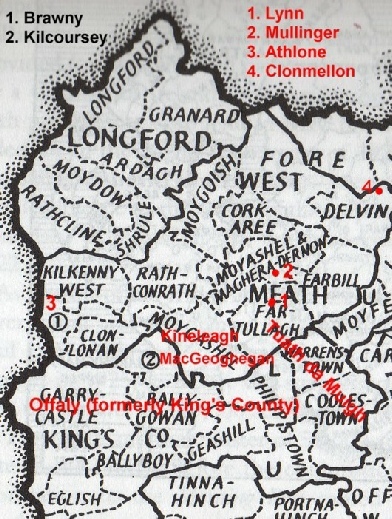 Note * Leinster, Ballymote and Lecan all add “dá Congal” to Flaind son of Díumasaich. Máel cian m Fogartaich m Cumascaich m Flaithbertaich m Flaind dá Congal. Genelach Ua Máel céin Tuat dá Muigi. Máel cian m Fogartaig m Cumascaich m Flaithbertaich m Flaind dá Congal. In these genealogies, the Uí Maelcein are a branch of the Uí Fhailge, a people preserved in the name Offaly, formerly called King’s County. 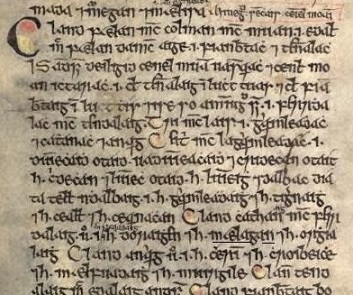 According to the Annals of Ireland, Maelcein or Maelchein lived about c.900, over seven hundred years before O’Clery and MacFirbis transcribed their Books of Genealogies. He had at least two sons, Lorcan and Conchobhar both lords of Ui Fhailge. Guaire son of Maelecain, priest of Clonmacnoise in Co. Offaly may have been another son. Concobur m. Mael Cein, ri h-U Foilghi, iugulatus est o Laignibh; translated Conchobor son of Mael Cian, king of Uí Fhailgi, was killed by the Laigin. Concupur p [canc.] Maoilchen ri h.fFoilge et a dha mac do marbadh la Lorcán mac Faolain; translated Conchobor son of Maeilchén, king of Uí Failge, and his two sons, were killed by Lorcán son of Faelán. Guaire, mac Mailecáin, sacart Cluana Mic Nóis, d'écc; translated Guaire, son of Maelecan, priest of Cluain-mic-Nois (Clonmacnoise), died. The Clann is mentioned in the 14th Century Topographical Poem of Giolla Na Naomh O’Huidhrin. Its border is like the land of promise". O’Huidhrin wrote his poem prior to 1420, when he died. It was intended to supplement John O'Dubhagain’s Topographical Poem of Leath Cuinn (Meath, Ulster and Connaught). O’Huidhrin gives an account of the principal families of Leath Mogha (Leinster and Munster) at the time of the Anglo-Norman invasion. In his footnotes on the poem, John O’Donovan says “Tuath-da-Mhuighe, i.e., the cantred of the two plains, called Tuomoy in an old map of Leix and Offaly in Leinster made in the reign of Philip and Mary. According to this map 'Tuomoy Nether and Upper' comprised the baronies of Warrenstown and Coolestown in King’s County” (see Map 4). O’Donovan also note “The family name, O’Maoilchein, is now unknown in this territory”. According to O’Hart, he claimed the ‘O’Maolchein’ were anglicised to Whitehead, but offered no evidence to support when this happened. During the late twelfth century, after the invasion of the Anglo-Normans in 1170, Strongbow gave the territory of Tuath da Muighe in Ui Fhailge (Offaly) to Robert de Bermingham. It covered that part of Offaly west of Offelan and later became known as Bermingham’s country. The territory of Tuath da Muighe is first mentioned in 1234, when the king sought to settle a dispute between Piers or ‘Peter de Bermingham in Totemoye’ and Maurice Cumin in Karnekedach, over the boundaries between their respective lands. Karnekedach or Crich-na cedach, is a small territory in the extreme north of Warrenstown. Tuath da Muighe lay in the English part of Offaly that came within the jurisdiction of Kildare. It was also one of the march lands between the province of Leinster and Meath. In 1289, John de Saunford, archbishop of Dublin and Keeper of Ireland, ordered Sir Geoffrey de Geneville to guard the marches of Athlone as far as ‘Totemoy’, and ‘Sir Peter de Bermingham’, junior, the marches of Totemoy to Rathangan, and John fitz Thomas Fitz Gerald from Rathangan to Ballymadan. Tethmoy is mentioned in several other thirteen century State Papers relating to Ireland. In 1284, the Barons of Exchequer in Dublin paid to John de Saunford his expenses for going with the justiciary to ‘Tothmoy’ with 30 retainers, 27 sutlers and 37 horses and remaining there seven days during June 1281. In 1295, ‘Peter de Bermingham de Thotemoye’ was one of a number of liegemen in Ireland, who were commanded by Edward I to join John de Wogan, justiciary of Ireland, in preparation for service in England. In January of the following year, as ‘Peter de Brymynghehan de Thotemoy’, he was commanded to be at Whitehaven in England by March, to enter the king’s service in Scotland. Again, the following year, as ‘Peter de Bermingham de Tottemoy’, he and a number of other liegemen from Ireland, including Peter de Bermingham de Athenry, were commanded to join the king in England in preparation for his war in France. That same year in 1297, Henry son of Ririth was appointed coroner of Carbury, Totemony and Otymmy. The Berminghams were notoriously ruthless towards the Irish, particularly the O’Connor Faly, who were the last of the native Irish kings of the Ui Fhailge. If the O'Maolchein in Tuath da Muighe survived the atrocities committed by the Berminghams, it was not as lords of Tuath da Muighe. They had clearly lost their territory to Robert de Bermingham and over the next few generations, his offspring would continue to consolidate their control and lordship over the land of Tethmoy. The whole territory appears to have been feudalised by the end of the thirteenth century, and by the beginning of the next century, John de Bermingham, now earl of Louth, felt secure enough to found the Franciscan monastery of Monasteroris in Tethmoy in 1325. The Berminghams were called by the Irish ‘Mac Fheorais’, ‘Son of Peirs’, and their monastery was also called ‘Mainistir Mac Fheorais'. The name is preserved in the townland of Monasteroris in the old barony of Coolestown, where the town of Edenderry is located, not far from the old ruined monastery. Clann Colman moir .i. .H. Maelechloind cona coibnesaibh & .H. Aeda .i. flaithi .H. mbhecon & .H. Fiacrach & Fir Muige Lacha cona flaithibh & .H. Domnallan i feraib Tulach & .H. Carraigh & Muinter Muiregen & Muinter Maelchein a Cenel Fiachach m. Neill isedh fodera as cailedh sechnon fer Midhi foro cruthsin fodaigh comad leo aireacus gach tuaithi & a forlamus do ghres. §766. Clann Colmain mhoir: hi Mail echlaind cona fodlaib, ocus cona coibnesaibh .i. .h. Aedha, ocus flaithi .h. mBeccon et .h. Fiachrach et fir maighe Lacha cona flathaiph, ocus .h. Domhnallan a feraibh Tulach, .h. Carraigh et muinter Muirrigein et muinter Mael cein i Cinel Fiachach mic Nell. Finally, in the ‘Genealogical Tracts by Irish Manuscripts Commission’ by Tóirdhealbhach Ó Raithbheartaigh (C. 67, Book of Lecan): ‘The children of Colmán Mor, ie, [Ui] Mail[s]echlainn and their relations, and Ui Domnallain in Fir Tulach and Ui Carraicc and Meic Muiricen and Muniter Mail Chein in Cenel Fiachach son of Niall Naigaillach’. The Cenel Fiachach are mentioned in the 14th Century Topographical Poem of John O'Dubhagain. In his notes on the Cenel Fiachach, John O’Donovan’s makes the following observations. Based on the above statement, the original territory of the Cenel Fiachach extended from Birr in the barony of Philipstown in Co. Offaly, which bounds the baronies of Warrenstown and Coolestown, and on the north, the Hill of Uisneach in the barony of Rathconrath in Co. Westmeath. We are told it was divided between the Macgeoghegan and O’Molloy’s lords, with the former retaining the name Cenel Fiachach in Co. Westmeath and the latter holding the southern part in Co. Offaly, called Firceall. In the genealogies, it is worth noting that the Muinter Muiregen (now Morgan) and Muinter Maelchein are inserted in a section that follows the Clann Colmain móir, whose chiefs were the O Maoilsheachlainn, otherwise O’Melaghlin, and not after the Macgeoghegan or O’Molloy’s lords. The O’Melaghlens were kings of the Irish in the old kingdom of Meath. Depending on the chronology and on how the phrase “in Cenel Fiachach” is construed, it could refer either to the lineage of the ‘cenél’ or the ‘territory’ named after the Cenel Fiachach or to both. With this in mind, the Ui Domnallain and the Ui Carraic (Carrick) were located in Fir Tulach, otherwise anglicised to the barony of Fartullagh, also known as Terrill’s country in the west of Meath, which was shired under the Counties of Meath and Westmeath Act of 1543. They were not located in Macgeoghegan’s country. This leaves the Muinter Muiregen and Muinter Maelchein, who appear to have lived in Macgeoghegan’s country or at least in that territory called Kenaliaghe, which is said to have covered the barony of Moycashel and part of the barony of Rathconrath (see Map 4). Significantly, a number of Mullegans appear in the northern part of Westmeath in the baronies of Cockaree and Fore, which is not far from Rathconrath. Where these families the descendants of the Muinter Maelchein or Conmaicne Rein? Interestingly, in the civil parish of Clonarney in the barony of Delvin, the townland of Mulliganstown was until the eighteenth century called Mulganestoun. It first appears on record in 1403, when it was held by Matthew Hussey, baron of Galtrim in Co. Meath. Very little is known about the early history of townland, which was part of the manor of Clonarney in the fifteenth century. It is located on the boundary between the barony of Delvin and Fore. In the adjoining civil parish of Killua there is an old family of Mulligan, who may have originally lived in Mulganestown. The civil parishes of Killua and Clonarney are included in the Catholic parish of Clonmellon. Almost nothing is known about the Muinter Muiregen and Muinter Maelchein. There are no genealogical pedigrees or annalistic notations extant to delineate how they are related to the main branches associated with the Cenel Fiachach. Their background is obscure and all that can be said about them with any certainty, they were native families who lived in West Meath and in that part still held under nominal Irish control by the Mageoghegan chiefs. After the Statutes of Kilkenny in 1366, the Irish, those namely who remained under their own chiefs and laws, were put as a community outside the English law that ruled the colonists. Furthermore, in 1460, the Irish Parliament enacted that civic freedom and admission to trades could only be obtained by Irishmen after they had been granted ‘English liberty’ from the king, and had undertaken to be of English array, habit and apparel. Even Irish chiefs had no right to plead in and be answerable in the royal courts. In effect, they were vassals owing simple homage to the English crown for their lands, but never subjects owing liege homage. They needed royal charters or an Act of Parliament to admit them to the English liberty. For the rest of the Irishmen population, individual charters of emancipation or naturalization were the only device for citizenship and freedom from the Irish Martial law or Brehon law. As result of the statutes of Kilkenny in 1366, two different legal systems (English and Brehon) operated in Ireland and this remained in place until 1603, when Brehon law was abolished under James I and English law was applied by local magistrates and royal representative. Prior to this, the authority of the crown was administrated through courts (palatinates or liberties), and was delegated to the earls and others. Most ran their own legal systems and probably used both common and Brehon law in their courts. The earliest reference I can find to the O’Mullegans in West Meath, before it was shired in 1543, is traced to Sean O’Maolagain, also known as John Mulgan, rector of the parish of Lynn near Mullingar. His name was known to the Irish as O’Maolacain and O’Maolagain, and to the English and the Roman Church as Mulgan, the Latinised form of Maelcain. Did they preserve his original surname? It seems so, as Mulgan is the anglicised form of Maelcain and Maelchein, and is used interchangeably with Mullegan or as it often appears in Medieval records as ‘Molligan’. Translation: The Bishop O'Mullagan, i.e. Bishop of Leighlin, died. Prior to his accession as bishop of the Diocese of Leighlin in 1419, Sean O’Maolagain, otherwise John Mulgan, was rector of Lynn, in the Diocese of Meath. Sean did not gain actual possession of his Episcopal temporalities of Leighlin until 1422. The bishopric of Leighlin embraced most of east Laois, Carlow and south Kildare. The parish of Lynn is located in the barony of Fartullagh or ‘Fir Tulach’. This old territory bounds the plain of Thuaithe Da Muighe in Co. Offaly (see Map 4) and raises the fascinating question, could the Muinter Maelchein have been the same family as the O'Maolchein, otherwise the Ui Maelchein in Tuath da Muighe? The geographical context strongly supports a possible tie between them, and if the same sept in Co. Offaly, they could have moved across the marches and settled in the territory of the Cenel Fiachach. However, we have two separate genealogical traditions, one Uí Fhailge and an inferred Uí Niall, which are difficult to reconcile, unless the O'Maolchein had indeed been displaced from their original homeland in Co. Offaly in North Leinster, during the early feudal period and by the Berminghams!On the other hand, the O’Maolchein in Tuath da Muighe could have remained as sub-tenants of the Berminghams. Whatever happened to the O'Maolchein, they disappear from record and not until the first half of the eighteenth century, do we find mention of the Mullegans of Ferbane in civil parish of Killaghally in Co. Offaly. In his last will and testament, which was written on 8 December, 1719, Thomas Mullegan of Ferbane, farmer, mentions his wife Sarah, daughters, Elizabeth, Anne, Bridget and Ellinor, his father James, and brothers James and Francis, and sister June Mullegan. He died the following year, when probate was granted on 1 November, 1720, at the Prerogative Court of Ireland. Until 1857, wills were proved in the Consistorial Court, that is, the Court of the Bishop or Ordinary, within whose diocese or jurisdiction the testator dwelt. However, if there were effects to the value of £5, in two or more dioceses, the will had to be proved in the Prerogative Court of the Archbishop of Armagh, Primate of all Ireland, which was the Supreme Court in ecclesiastical jurisdiction had cognisance. It is evident that Thomas had effects in at least two dioceses and he may have held property in the town of Athlone in Co. Roscommon, where he had a brother Francis Mullegan, a merchant of Athlone. The town is located in the diocese of Elphin, whilst the parish of Killaghally is in the diocese of Clonmacnoise. Francis Mullegan, merchant, and James Mullegan, tanner, are named in the Census of Elphin in 1749, which lists the name of every head for each household in the diocese, their address, occupation, number of children aged 14 and above, and the number under 14, and the number of male and female servants and their religion. Ffrancis Mullegan, merchant, Papist, 1 child under 14, 4 children above 14, 1 male and 1 female servant, all papists. James Mullegan, tanner, Papist, 1 child under 14, 1 male and 1 female servant, all papists. Thomas Mullegan, merchant of Ferbane and nephew of Francis Mulligan of Athlone, died in 1761. In his will, which is dated 23 October 1758, he named his wife Ellinor, son Thomas, daughter Anne, and nephews John Barns and Thomas Cruise. Probate was granted on 26 November, 1761. He was either the son of Thomas Mullegan, farmer, or his brother James Mullegan, who appears to be the same James Mullegan, felt marker in Athlone. In 1721, Edwin Thomas granted a house and plot of ground to James Mullegan, which was lately occupied by Francis Cabe, but now in James’s possession. His tenement was located next to Thomas Moran’s plot, on the land leading from the market house of Athlone to the River Shannon. The grant was also witnessed by Francis Mullegan of Athlone. The market house of Athlone was located in the western part of the town, across the River Shannon in Co. Roscommon in the province of Connaught. The other half of the town lies on the east side of the river in Co. Westmeath in the province of Leinster. For generations, the Mullegans of Ferbane appear to have been freemen of the town of Athlone and leased several properties in the western part of the town, known as ‘Irish Town’. They first appear on record in 1640, when the will of ‘Nichol Mullegan’, merchant of Athlone was registered at the Prerogative Court of Ireland. Nichol or Nicholas Mullegan was probably the father of ‘James Molligan’ of Athlone, who was one of a number of Irishmen and women sentence by the Cromwellian administration to be transported into Connaught probably for his part in the Irish Rebellion of 1641. By a decree issued on 18 June, 1656, James was to be transported and by a settlement issued on 8 August, 1656, he was to receive 240 acres of land in Connaught, which was unspecified. He was probably never transplanted, but remained in the town of Athlone. He and Margaret Whaples, relict, were appointed administrators of the estate of the late Warham Whaples, merchant of Athlone, on 1 July, 1669. It is possible, James Mullegan was the father of Edmund or Edward ‘Molegan’, who was a freeman of Athlone and one of 84 signatories to a letter in 1684, offering condolences to King James II for the death of his late brother, Charles II, and declaration of their loyalty and obedience freely to him. I suspect, though, James was not the father and that Edmund belonged to another family. After the Irish Rebellion in 1688, Edmund’ Mullegan’s house in Athlone was burned. It was located in the eastern half of the town, also called ‘English Town’, across the River Shannon in Co. Westmeath. The town was held by Col. Richard Grace, formerly a chamberlain to James II, when he was Duke of York. After the battle of the Boyne in 1690, the eastern half of the town was evacuated and Col. Grace burned it. He then broke down some arches of the bridge crossing the River Shannon and strengthened the walls in western half of the town. The property held by the Mullegans of Ferbane was located in the western half of the town, which remained in the hands of the Jacobites for most of the war. Later, the Irish Government undertook a survey of Catholic estates in Leinster that were to be confiscated and in Athlone, ‘Edmund Molligan’s house and garden were surveyed as part of the tenements held by the Earl of Clanrickard and Edmund Fallon, Sovereign of Athlone. The survey notes the property was burned during the rebellion, but no date is assigned. The history of the Mullegans of Ferbane and Athlone may well have gone back even further, as the State Papers of Ireland note the names of ‘William Mollegane, James Mollegan, Barnabas Mollegane, Peter or Piers Mollegane, and Nicolas Mollegan, and their issue’, who received the English Liberty in 1558. It is nowhere stated if they came from Ferbane or Athlone, but it may be inferred, this family held some trade and were perhaps merchants; the most likely were the Mullegans of Ferbane and Athlone. If this theory is correct, the Mullegans of Co. Offaly may have been amongst the first O’Mulligans in Ireland to have been granted the English Liberty and to adopt the Anglo-Irish custom and habit. It also suggests, a branch of the O'Maolchein survived into the sixteenth century and what is interesting, prior to the Irish confiscations of 1690, Ferbane was part of the estate of Terrence Coughlan, Esq., of Castle Kincora, now Kincor. The Coughlans or MacCoughlans were native chiefs, who held the territory of Delvin-Eathra or Delvin-MacCoughlan. It was nearly coextensive with the barony of Garrycastle in the west of Offaly. If the O'Maolcheins had been displaced by either the Berminghams or their successors, a branch may have settled under the MacCoughlans. Created 6th January, 2018: updated 29 January and 3 March, 2019.